Benita Kayembe first learned about the EOPS (Extended Opportunity Programs and Services) program during her first semester at Cañada College when a classmate told her that there was a program on campus that could give up to $350 in book vouchers. She saw this as amazing opportunity because books can be very costly. While at the EOPS office, she learned more about the program and applied to be an EOPS student. Applying to the EOPS program was one of the best decisions that Benita said she has ever made because the faculty and staff helped her to worry less about her financial needs as a student in order to focus more on achieving her academic goals. EOPS not only provided her with financial support with book vouchers, they also provided high quality academic counseling services, transportation support with a monthly bus pass and many other supplies that helped her as a student, such as backpacks and calculators. As an EOPS student, Benita was constantly, and positively, pushed to be a better student and was reminded that the program was there to help her to successfully achieve her academic goals. 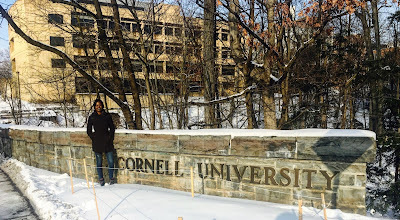 When the time came for her to apply to transfer to a four year university, Cornell University was her top choice as it is one of the best institutions that offers her major, International Economics and Development. The support of her EOPS counselor helped her to look into all of Cornell’s transfer requirements and wrote her one of the two recommendation letters required for her application. Benita is thankful for the EOPS team, as well as many other support systems at Cañada College, for the guidance and support that led to her acceptance into Cornell University, an Ivy League Institution. She transferred to Cornell as a junior in Spring 2018 and is majoring in International Agriculture and Development with a concentration in Economics and Development.